Are you one of the 29.58 million people over the age of 16 working in the United Kingdom? Do you feel like it’s getting harder to save or survive to payday depending on your goals in life? Worry no longer because the answer is that it is. If you are an average earner your salary is now back to levels last seen in September 2001. As always on Retirement Investing Today let’s look at the data. The Office for National Statistics reports that the Average Weekly Earnings for the Whole Economy including bonuses and allowing for seasonal adjustment is now £471. This is nominally £2 less per week than last month and is the nominally similar to that of April 2012. Annualised this is £24,492. Breaking this figure down between the Public Sector and the Private Sector reveals the Public Sector to be still coming out on top by some 4%. The Average Public Sector employee earns £488 per week (up 2.1% year on year) compared to that of the Private Sector which funds those earnings (of course in conjunction with a lot of government borrowing) at £467 (up 1.7% year on year). Unfortunately, while Average Joe’s Earnings were falling by £2 in nominal terms the value of his Earnings was actually being eroded by inflation to the tune of £4.40 over the month. In line with my opening statement this loss of purchasing power has been going on for quite some time now and is clearly demonstrated by my two charts today. 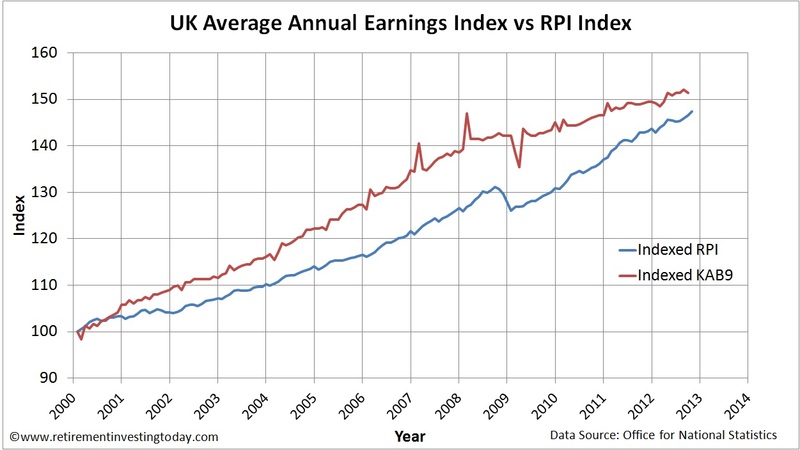 The first chart takes the Retail Prices Index (RPI), the Whole Economy Average Weekly Earnings (KAB9) and then converts them both to an Index that starts in 2000 with a value of 100. 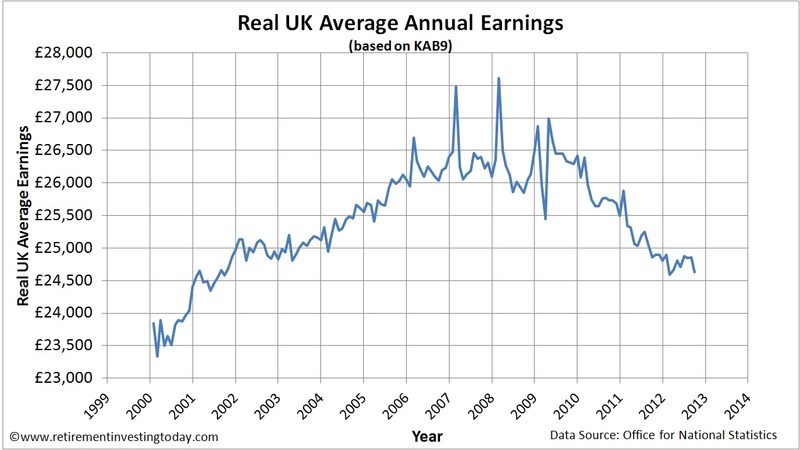 This clearly shows how Earnings outpaced inflation until around 2008. During that period every year we felt a little richer however that is now fast being eroded. My second chart then crashes both of these data sets together by correcting Earnings for the effects of inflation. the trouble is that the way people seem to feel is proportional to the derivative of the earnings chart. Now I remember 2000 as a pretty good time in the UK, so having that living standard looks like a good deal, but people have inflated their lifestyles in the interim, so having 2000 quality living standards in 2014-ish is going to result in some seriously hacked off Brits, because it's on the way down. Exactly the same living standard felt great in 2000 'cos it was on the way up.